Silver Shekel, 12.08 g., 22 mm, likely an imitative issue struck in the early 1st century AD, just prior to the Crucifixion of Christ. Rev. Eagle on prow to left, large KP in right field. 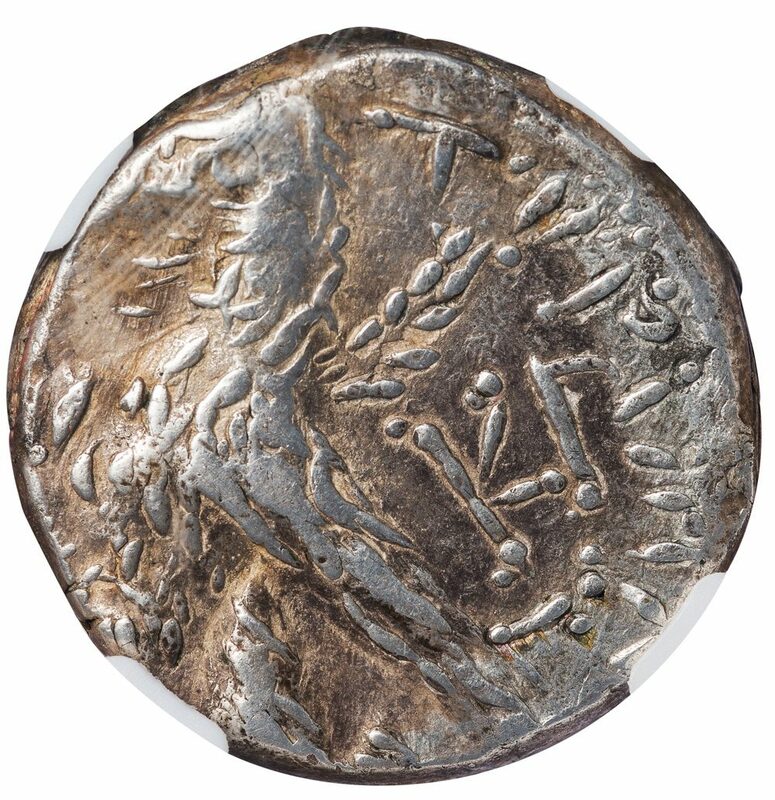 Unlisted in DCA Tyre Supplement Release 2, but the style suggests the coin is based on official shekels minted around years 140-158, in particular the emissions of year 158 (Cohen 571 ff). NGC graded CHOICE VF. This coin, approximately 2 grams underweight, features an idiosyncratic style and peculiar handling of the reverse where the KP monogram is atypically large. The NGC catalogers have correctly labeled it as an “imitative issue”. 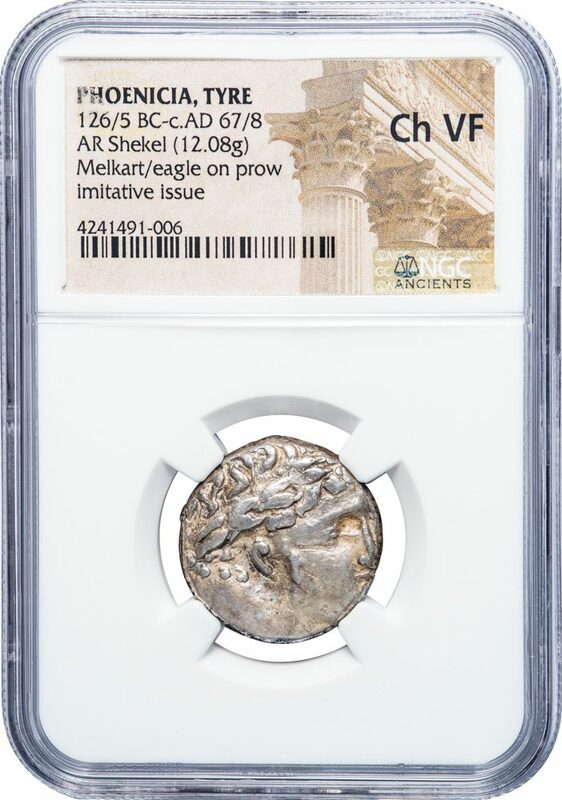 Imitative issues were fairly widespread in the ancient world, being produced by “unofficial” mints in an effort to fulfill the need for currency. Since such mints were largely clandestine, the quality of the engraving work and often the amount of metal used was substandard, as in this case. What is remarkable is that this perhaps the only piece so far documented as “imitative” and is quite unlike the “Crude and Illegible” issues categorized by Cohen and which were likely official products of the mint. 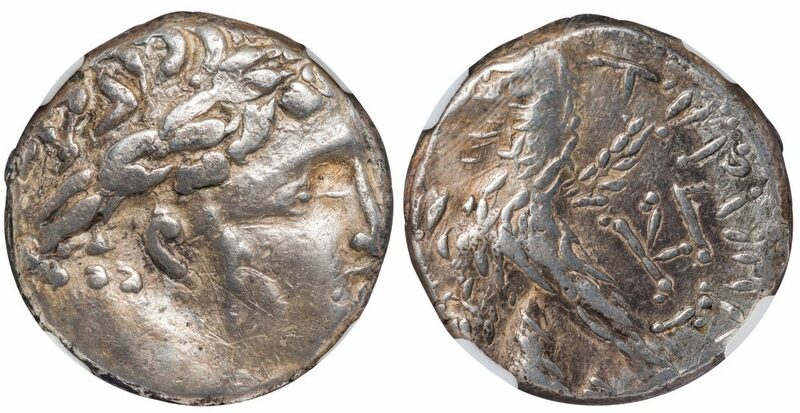 The style of the imitation leaves little doubt that it was based on an original coin from the Tyre mint dated in the latter part of Christ’s lifetime.